It all started with me wanting to post this picture. 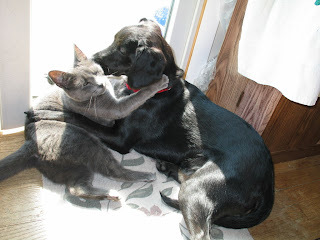 Meet Nia (the peppy pup) and Sadie (the crazy cat). They spend 95% of their waking hours chasing after each other and wrestling. Yes, wrestling. Nia has a few battle scars and Sadie constantly has dog slobber on her neck. It’s all in fun, but things do get rough. Yet at night, they sleep curled up next to each other and Cheyenne (the sensitive dog). I’ve always suspected that, though they fight like cats and dogs (ha! ), Nia and Sadie really, truly love each other. A few nights ago, Steve emailed these pictures saying, “I knew it!” He caught them sunning together by the sliding glass doors, cuddling. I was certain he’d photo-shopped the pics. He hadn’t. So cute! While thinking about his post, I thought about all the tales and pics I have of my beloved animals and how I’d love to see pics and hear tales about YOUR pets. And maybe some alerts about special articles or benefits for animals. Domestic and Wildlife. I emailed Barb and Bren, who are also avid animal lovers, and hence we created a new page here at SIS: Animal Tales! You can click to it using the link in toolbar above. We really want it to be interactive with constant new pics and tales. We encourage you to send us a photo (jpeg attachment) and/or a short tale or article about your pets or any animals at all. We will upload them to the Animal Tales page. Share the animal love, folks! Spread the word about worthy animal causes or helpful animal info! Meanwhile check Animal Tales often for new content and explore the links in the sidebar. We’re excited about Animal Tales and hope you’ll share in the fun and education. I love this idea. Now personally I don't have any pets, YET! It's a major source of debate at my house. I may have lost the battle but I will never win the war. So I plan to add my wish list for pets every now and again and share my tales of "HOW THE PET WAS WON"! BTW, Love the pics of Sadie and Nia. We need one of Cheyenne! You mean you WILL win the war, Barb! Right? HOW THE PET WAS WON. I LOVE that!! I'll be uploading some pet picks on the Animal Tales page... including of course, Cheyenne! I do hope we hear from others wanting to share their pics and tales too! Oh my gosh. Major typo! Yes, yes, yes, I WILL win the war. Awww... how adorable is that?! We haven't any pets, but we'll enjoy seeing everyone else's! Hi Fedora! 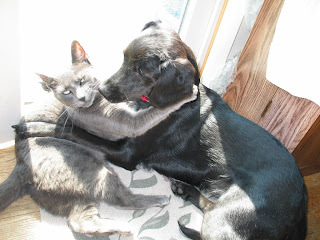 We're hoping to post pics of other SIS reader's pets soon! Keep checking back at ANIMAL TALES. Otherwise, if you ever have any news or thoughts you want to share about animals... just email us! We haven't had any pets in quite few years. We keep thinking we'd like to get another dog, but we don't have a fenced yard and we kind of need one. I have got to get my pictures of my beloved Sir Fedrick Sweeny a big ole white cat with orange patches, scanned. I had some orphaned chicks and he let them sleep curled up to his tummy to keep them warm. Funniest thing to see. No interest in eating them. I do have a Harlequin Great Dane who is just a year old and whenever she goes outside I have a cat that hates dogs but loves her. Choad will come up to her everytime and twine around her legs. Choad weighs about 10 pounds and Gidget weighs in at about 180. Tori, maybe you and Barb will end up getting dogs at the same time. Fingers crosed for both of you! Yes, a fenced is yard is best, although lots of people just walk their dogs. My dogs aren't ones for staying outside for long, but they do like that freedom to run free in the fenced in area. Anyhoo, fingers crossed for you! Oh, Sia!! You simply must send us pics of Sir Fredrick, Choad and Gidget. LOVE that you named a Great Dane 'Gidget'. *snicker* Anyone aside from me remember that Sally Field character? Sending you a cyber nudge t send thosepics to us so we can post them. And please do share some favorite tales! Yes, Tori, let's get a dog! I don't have a fence either but I'm thinking I could train it to know the boundaries. If you could, what kind of dog would you get? Sia! If you don't share we will harass you endlessly. I look forward to meeting your crew! Beth, those photos are unbelievable! I don't think I've quite seen anything like that. I especially love the second one, with Sadie rolling her eyes at Nia's affection! That is a physical display of true love!! Taylor, I'll ask Sue. Maybe she can send me that pic of you and Buddy from 'Pet Day at the Library'. BTW, they're having another one on December 19! In the meantime, if you do find a pic, please send it to us! We don't live in an area that's very conducive to walking a dog (plus none of us are very up to walking a dog, anyway). Given some of the neighbors we've had move in lately, I've been joking (sort of) about getting a dog that's big and mean. *g* But we'd probably get something smallish. But not fit in your purse small, though. LOL!